This is my new, healthy substitute for sour cream and cream cheese in recipes. Although lately, it hasn’t even made it into recipes- I end up finishing it with toast and crackers! Its so simple and tastes soooo good… slightly tangy and creamy. The only thing to remember is that you need to start making it at least one day before. 1. Mix the salt into the Greek yogurt. 2. Line a mesh strainer with cheese cloth so that the ends are hanging out over the edge. If you don’t have cheese cloth, you can use multiple layers of thick, heavy-duty kitchen paper napkins. Spoon the Greek yogurt onto the cheese cloth. Fold the edges over it and place the strainer on top of a large bowl (to collect liquid). Place this in the fridge overnight. 3. 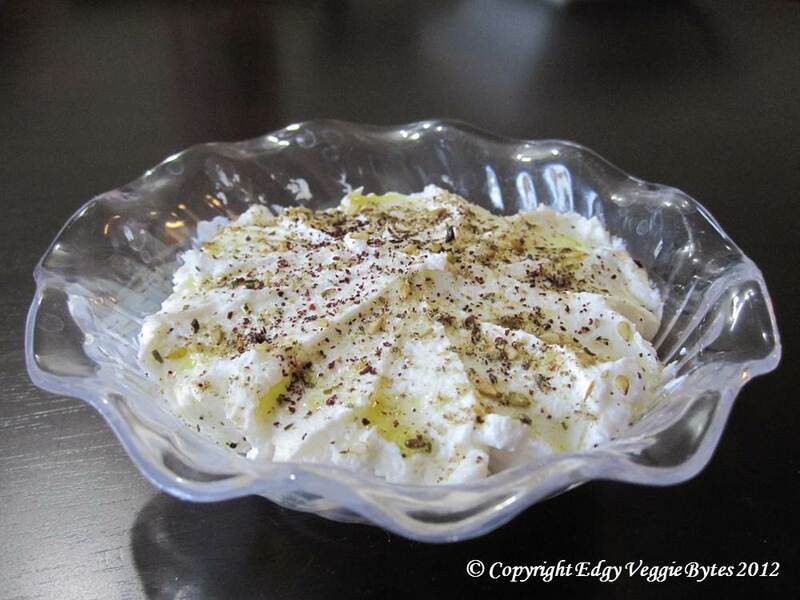 The next day, spoon out the thick yogurt (labneh) into a serving bowl. Drizzle olive oil on top. Sprinkle desired spices (if any) on top and serve!